Perform a complete SOAP note from start to finish on your iPad or iPad Mini, connect to the Internet and chart from anywhere. With NextGen Office – wherever you are, your patient records are only a tap of the fingertip away. Whether you prefer touch, talk (dictation) or typing, NextGen Office is flexible enough to support the best data input method at just the right time on your choice of device type – iPad, desktop or laptop! 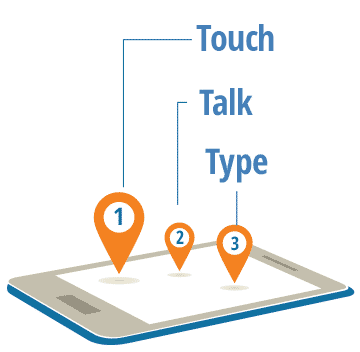 Since NextGen Office is optimized for touch, fingertip data entry is fast and easy. In addition, NextGen Office’s iPad EMR is also designed to populate data via dictation in any text field. With all iPads (except the first generation), dictation functionality is built-in and can be used to replace typing for faster data entry, without the need to invest in expensive dictation software. Mobile medicine is the future of healthcare. Don’t get left behind – start using NextGen Office on the iPad today. NextGen Office’s iPad EHR was designed so you can chart on the go, from anywhere that has an Internet connection. Unlike most of our competitors, NextGen Office is completely iPad native. This enables you to use the full software without limitations straight in your iPad browser – no apps or installation necessary. Charting at the point of care is the gold standard of EHRs. By using a mobile tablet such as the iPad, you can chart at the bedside or in the exam room. Never worry about a bulky computer screen coming between you and your patient – and have all of the charting completed by the time the patient leaves the exam room. Best of all, when it’s time for you to work at your desk, use NextGen Office on any computing device: PC or Apple, Windows or Mac, on either a desktop, laptop or mobile tablet. Flexibility is the key, and with NextGen Office you are always using the right device at the right time! NextGen Office is the only iPad Pure-Cloud EHR to hold special demonstrations at select Apple Stores nationwide for physicians, their staff and medical billing company executives. Apple hosted NextGen Office events enable physicians and their staff to hear about our EHR. They experience how to utilize Apple products in their practices, firsthand, at the Apple Genius Bar. NextGen Office on Apple devices like the iPad, enables providers to significantly increase the efficiency of their practice and most importantly maintain eye contact with their patients while charting.